A true-to-life epic of Kurdish students excitedly anticipating social revolution. Baran: You're too brave to accept this. Govend: No one wanted this village. And the children here, they needed education. I like it here. I like the children. Baran: No one forced you. Govend: No. I always wanted to study till I was 26. And now, I feel too old for here. Baran: How old are you? Govend: 28. But I got one thing. If you're not married at this age, people think there's something wrong with you. Anyone who reads international news reports, knows that Iraqi Kurdistan is now in the centre of major geopolitical developments. Kurdish fighters, called peshmerga, are trying to repel the radical Islamic State, with the assistance of the US. 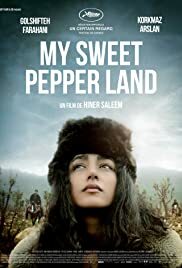 It's interesting background information, because 'My Sweet Pepper Land' is a film about a peshmerga fighter. 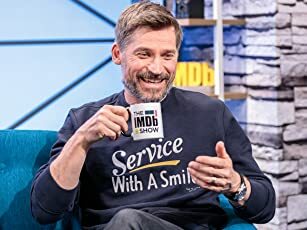 The film is set in the period after the war against Saddam Hussein. The Iraqi Kurds have created their own, autonomous region and are trying to rebuild law and order. Former peshmerga fighter Baran takes part in that effort, not so much because of idealistic reasons, but to get away from his mother who is desperate to arrange a marriage for her son. He gets a job as the new police officer in a remote village near the Turkish border. On his way to the village, which can only be reached on foot or on horseback because of a destroyed bridge, he meets another new government official: Govend, the pretty school teacher. She is also trying to escape an arranged marriage, set up by her father. But the villagers are not keen on education for their children, nor on law enforcement. They rather rely on protection from a local criminal, who arranges illegal smuggling activities in the remote, mountainous area. Soon, both Baran and Govend clash with this man. Against all odds, they stubbornly defend what they think is right. The director was clearly influenced by the classic westerns. He cleverly inserts western elements in this Kurdish setting. The horses, the hats, the long, fur-lined coats, the guns everyone is carrying - it makes Kurdistan look like the American wild west. The story itself is of course a classic western theme: a lone man fights for justice in a hostile environment, and at the same time provides protection for the local beauty. The mix of Kurdish and western elements make this a nice and enjoyable film. It also provides insight in the Kurdish culture and history. The opening scene for example is at the same time hilarious and tragic: it shows how officials from the new Kurdish government clumsily try to hang a criminal. The man is standing on a ballot box with the rope around his neck. One last remark: the soundtrack partly consists of beautiful music played by school teacher Govend on a very distinct musical instrument. You're inclined to think that this is a traditional Kurdish instrument, but actually it is a Hang, a Swiss invention from 2001.